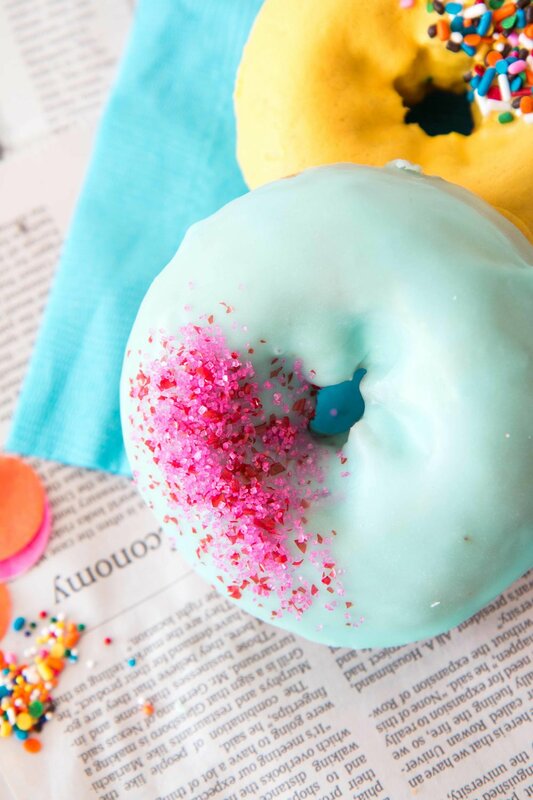 National Donut Day is tomorrow and of course, we're here to show you an easy way to celebrate- because who doesn't love an excuse to eat donuts?! We figured nothing goes better with donuts than coffee, milk and a little peace and quiet in the morning. So we styled our Donut Day party like a morning tea party, complete with fresh flowers and the daily paper to start your day with some joy and relaxation. As always, we love to pay attention to the little details to bring the table together. To tie in the theme of reading the paper, we made a tablecloth out of a newspaper, which made our bright colored donuts and napkins POP. And speaking of the donuts- we frosted them ourselves! We just bought plain donuts, white frosting, and food coloring. Mix up some colors you like, warm up the frosting to make it runny, then dip or drizzle! Add sprinkles for even more color and texture. And of course, we couldn't resist the donut puns. And nothing says "donut disturb" like our team before we've had our morning coffee. So we made these letters using poster board and paint! We even found some amazing flowers at the Union Square Farmer's market that matched perfectly. We arranged them in this yellow tea kettle which was too perfect, and another really easy decor element that's perfect for a tea party. We had 3 in different colors! Last but not least, let's talk about the finishing touches. There are so many ways to add decor to your party, and the obvious ones might be flowers, napkins or drinkware. What people don't consider is just how the small things (like sprinkles scattered as confetti) can make your party a show stopper! 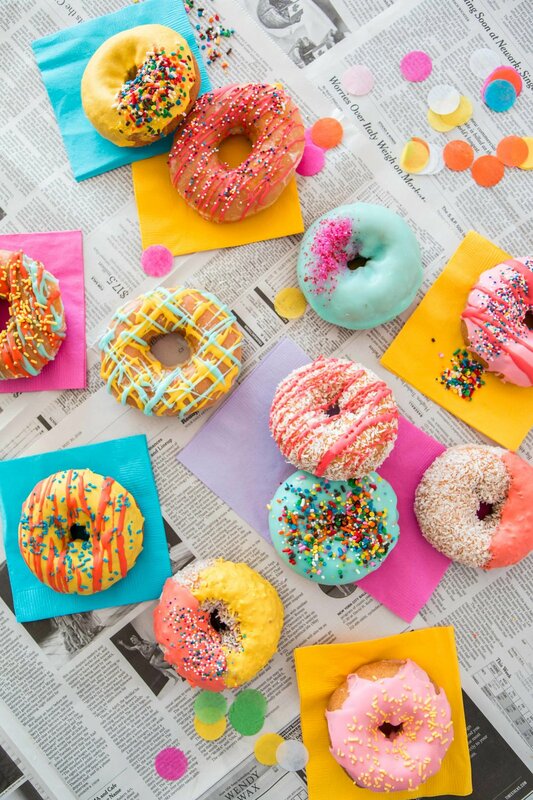 We used sprinkles in the straw holder, scattered as confetti, and topped on our donuts to bring texture to the table. 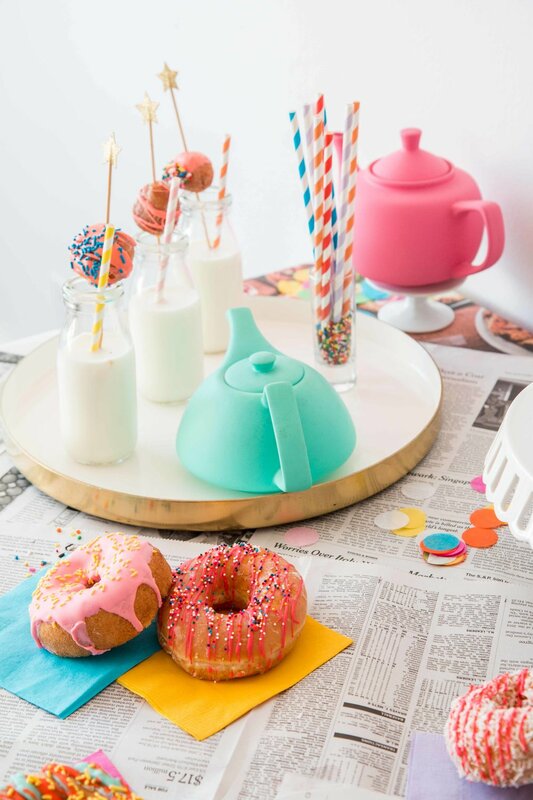 We also added mini donut holes to skewers on our milk jugs for color and a little something extra. We hope you enjoy Donut Day just as much as we did!